Taylor Swift urged her 112M followers on Instagram to register to vote. After Taylor Swift posted on Instagram asking her followers to vote in the midterms, registrations spiked both nationally and in her home state of Tennessee, said Vote.org, a site devoted to registering voters and increasing voter turnout. The number from around the country who registered on the website shot up to 240,000 in the 48 hours following Taylor Swift's call to action beamed to her 112 million Instagram followers on Sunday night, said Vote.org's communications director, Kamarie Guthrie. While there are a number of factors contributing to that increase, including many states' voter registration deadlines, about 102,000 people ages 18-29 registered. Swift's home state also saw a big increase in registration. In the entire month of September, Vote.org registered 2,811 Tennesseans. Now on Oct. 9, the site already has nearly double that number for this month. "Vote.org saw [Tennessee] registrations spike specifically since Taylor's post," Guthrie said. Web traffic on Vote.org has jumped too, according to Guthrie. Average traffic on the site usually tops out at about 14,000 visits, but in the 24 hours after Swift's post, traffic reached 155,940. Swift in her post on Sunday night said she will vote for two Democratic candidates for the U.S. Senate and House in Tennessee. But she urged her followers to vote for candidates of their choice. "Please, please educate yourself on the candidates running in your state and vote based on who most closely represents your values. For a lot of us, we may never find a candidate or party with whom we agree 100% on every issue, but we have to vote anyway," she wrote. In her Instagram post, Swift broke her political silence and endorsed former Tennessee Gov. Phil Bredesen (D) over Rep. Marsha Blackburn (R) in the state's Senate race. Swift also endorsed Democrat Jim Cooper in his re-election bid for the House of Representatives. Swift said she though she'd rather support female candidates, Blackburn's "voting record in Congress appalls and terrifies me." She rattled off Blackburn's voting record, saying "She believes businesses have ta right to refuse service to gay couples. She also believes they should not have the right to marry. These are not MY Tennessee values." She continued on in her post, saying, "I always have and always will cast my vote based on which candidate will protect and fight for the human rights I believe we all deserve in this country," she said. "I believe in the fight for LGBTQ rights, and that any form of discrimination based on sexual orientation or gender is WRONG. I believe that the systemic racism we still see in this country towards people of color is terrifying, sickening and prevalent." Mary Mancini, chair of the Tennessee Democratic Party, told ABC News that she was excited about Swift's decision to get political. “It's really exciting. She did what every American should be doing, she came out and made a case for why shes voting the way she is. We know what people think about Tennessee and the truth is Tennessee is in the middle of transformation," Mancini said. "A new generation of leaders are coming from across the state that are shaping who we are and who are going to be. She speaks for them. She's who Tennessee really is and what our values are. That's anyone, no matter who are, or what you look like, or where you live should have the opportunity for a better life for you and your family." Mancini said Democrats in many parts of the state are often bullied into silence and hopes Swift's post gave them courage to be vocal about their beliefs. "Imagine someone who doesn't have her stature or megaphone being bullied for thinking the same way. Everything there is is geared towards silencing people who have the same viewpoint that she does. It's been a great thing for Tennesseans that share those same values," Mancini said. 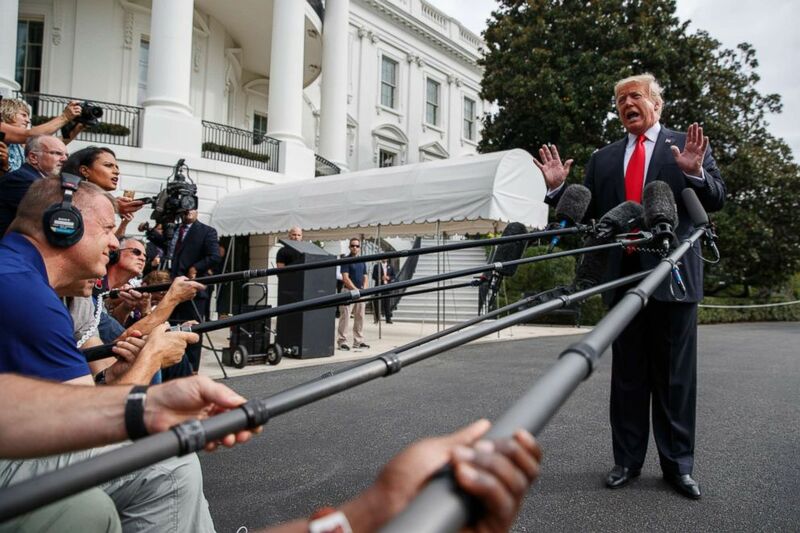 (Evan Vucci/AP, FILE) President Donald Trump speaks with reporters on the South Lawn of the White House, Oct. 8, 2018, in Washington. Trump praised Blackburn to reporters on the White House's South Lawn after learning of Swift's post, saying she is "doing a good job." He continued, "I'm sure Taylor Swift doesn't know anything about her. Let's say that I like Taylor's music about 25 percent less now."